My favorite trend this summer was the lace short – cute and feminine, without being too proper. I spiced them up a bit with the addition of antique gold-colored metal studs. In the following post, I’ll show you how to create your own custom pair. Linen shorts – I recommend against denim because it is too thick to comfortably work with. You will also want to avoid anything that stretches to fit – the lace wont stretch after it’s been applied, causing the shorts to become too tight. Metal studs, if desired. They do come in an iron-on variety, but I prefer to use the push-through version because they are more reliably permanent. I chose to have my lace start after the initial waistband, but you can start as high as you’d like. Your ends should meet in the middle of the front side, and you’ll want to make sure you’ve left about a half inch of lace loose at the start and end of each layer – we’ll use that later on to create relatively invisible seams. Also, to keep the lace spaced evenly, I used a pencil to mark out my path. Unwind a length of iron-on tape (1), and line it up along with the lace for the top row (2). Next, heat the tape with an iron, following the directions on the package. I personally achieved better results more quickly with a higher temperature, but technique may vary product to product. Continue around your shorts until you have reached the beginning, attempting to keep the lace as straight as possible as you go (3). Try not to worry too much if it’s not exactly perfect – no one will be able to tell once we’re done. Repeat until you have reached the bottom of your shorts (4). My shorts were short enough that I did not need to do a layer around each leg hole, but depending on the length and fit, you may want to include that extra layer. If you place these seams on the inside of the leg, they will blend in much more easily. In this step, we will be finishing the seams. 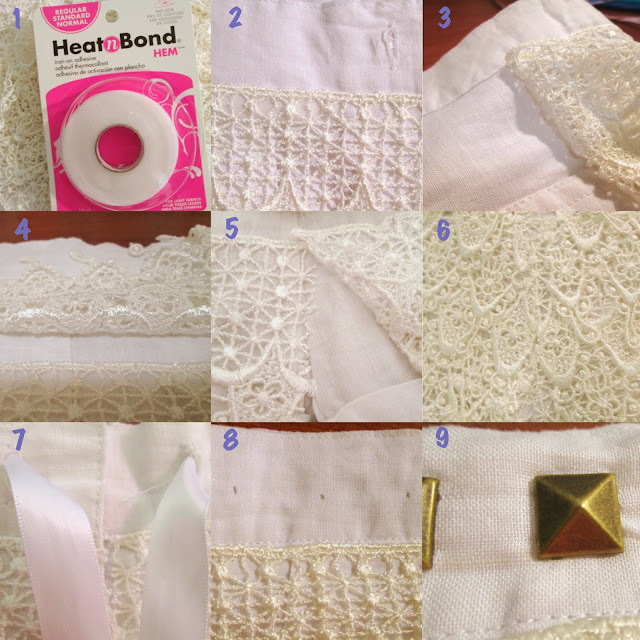 This is most easily done by lining up the edges of the lace (5), and sealing them with a piece of iron-on tape placed vertically so that the ends are being adhered to both each other and the shorts (6). I measured and trimmed the edges first, but it you are less confident in your ability to match them up, you can trim the excess after the ends have been attached. If your shorts have a zipper and/or button, you can wrap the first few layers of lace around the end of the flap. This way, the zipper or button will be fully functional, and you’ll have a neat edge. Finally, to create a more form-fitting look, create a small seam towards the bottom of the backside, and seal it using the same technique we used for the front. This seam only needs to go up about one fourth of the way. This final step is optional. I chose to attach five metal studs on each side of the front to give it some extra pizzazz, but the shorts look just as cute without them. I recommend planning out each stud’s spot before applying – this will help create an even line (8). You can find quality studs in a variety of colors online; I found some from M&J Trimming that were decently priced (9).